Alan Cooper, often regarded as the Father of Visual Basic, developed the drag-and-drop feature. His company, Tripod, was approached by Microsoft and Bill Gates to expand that feature into a form building application. Developed under the code name Ruby, it did not include a programming language so Microsoft decided to bundle it with the BASIC programming language. 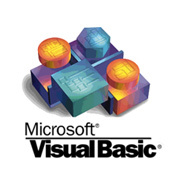 As a result, Visual Basic was born. Games like Rattler Race and Rodent’s Revenge exploded into the scene, which laid the foundation for how games are created and developed today. Similarly, the Visual Basic team is humbled to see game engines like Unity and Unreal were inspired by this platform. After many successful iterations from Visual Basic 1.0 to 6.0, Microsoft retired support in 2008 and in the meantime created the successor to this popular program, Visual Basic .NET. This program provided many enhancements, all ultimately focusing on what made Visual Basic popular: the rapid application development platform. In 2005 Microsoft also launched the Visual Basic 2005 Express which offered the tool for free for the first time, geared towards students, hobbyists and novices. Visual Basic in all its forms has been used by tens of millions people across the globe.